Ducs @ the 'Bucks - End of Season! 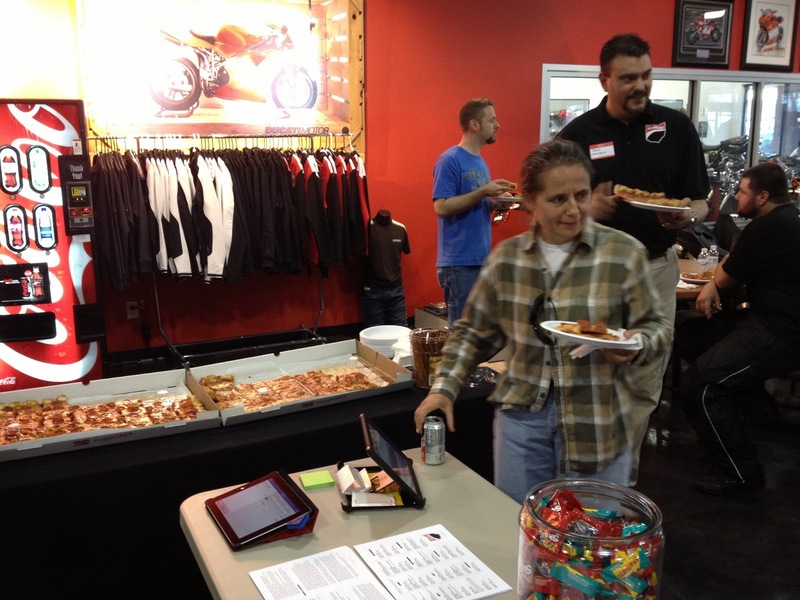 Thank you all for making our Ducs @ the 'Bucks event such a success! We have decided to end the season and we will resume next spring. We've enjoyed the coffee, rides, and chat with every one of you that made it throughout the year and look forward to 2014! Ducati Welcome Kits Arrived August 13th! We received a HUGE shipment from Italy! Every Member that signed up before June 15th can pick up their Welcome Kit from Ducati at any of our NEODESMO events! Just let us know you will be attending and we'll bring it. The kit contains a patch, a pin, a t shirt, a bag, and a membership card. Please note that if we never received your birthday, you will need to provide it in order to pick up your Kit. We were given a limited number of their Redline magazine. We'll bring a few to each event if you want to claim one! We also received banners and decals for our supporters, which have been delivered to the Dealers. 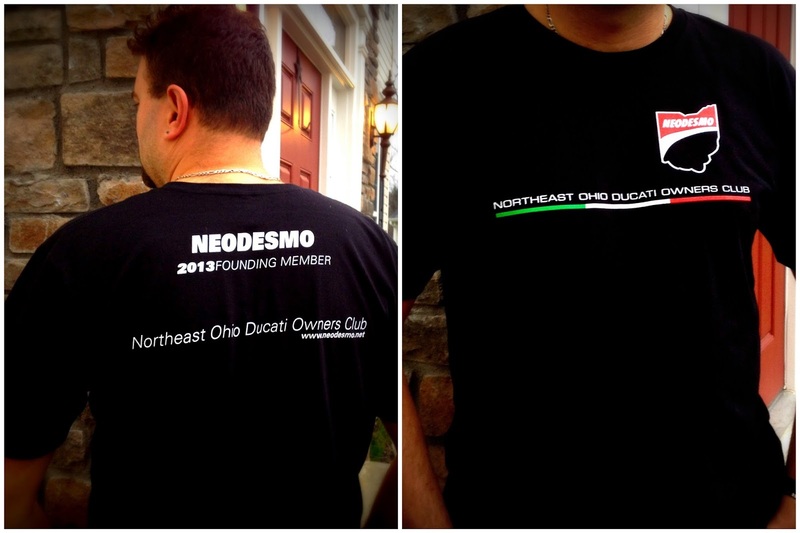 Want the world to know you are a Founding Member of the only Northeast Ohio Ducati Owners Club? NEODESMO Club Gear is now online! You can check out with PayPal or a credit card (just pick the No PayPal Account option), and you can have the items shipped or choose to pick them up from us at our next event! ONLY 50 were made. This is your last chance to wear our original logo! NEODESMO does not charge membership dues and is not financially supported by Ducati. Any profit from the sale of Club Gear goes to either recoup our costs or to save for costs associated with future events or operating expenses. Thank you for your support! Due to the severe weather, we've cancelled tonight's Club Mangia. We will instead meet at the same time TOMORROW, July 11th. Please respond to the email we sent out if you can make it! Don't forget that we are planning to attend the Superbike races this Sunday and Vintage Days next Sunday at Mid-Ohio! Check the Google Group to find others to ride over with. We will be at the track by 9:30AM. Mid-Ohio Superbike Race Day Meetup - Please post on our Google Group to coordinate a ride to the track. Mid-Ohio Vintage Days Meetup - Please post on our Google Group to coordinate a ride to the track. Members also received the email to RSVP for our Club Mangia this Wednesday. See you there! 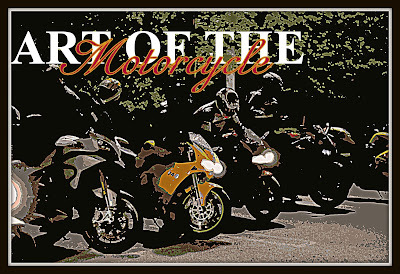 Northern Ohio Ducati and Triumph is presenting an exhibit called "Art of the Motorcycle" at the Joseph Saxton Gallery of Photography in the Canton Arts District during Canton's June 7th First Friday! The exhibit will include over 30 unique motorcycles to admire. Plus, their customers and NEODESMO Club Members are invited to attend a VIP Preview Party the night before the exhibit opens! "We invite you to attend to view motorcycles in a very unique and special light and to participate in live and silent auctions to raise funds for the 'Arts in Stark Foundation.' 100% of all donated funds from the auctions will be presented to the 'Arts in Stark Foundation' in honor and recognition of the efforts of Robb Hankins and Tim Belden for our community!" 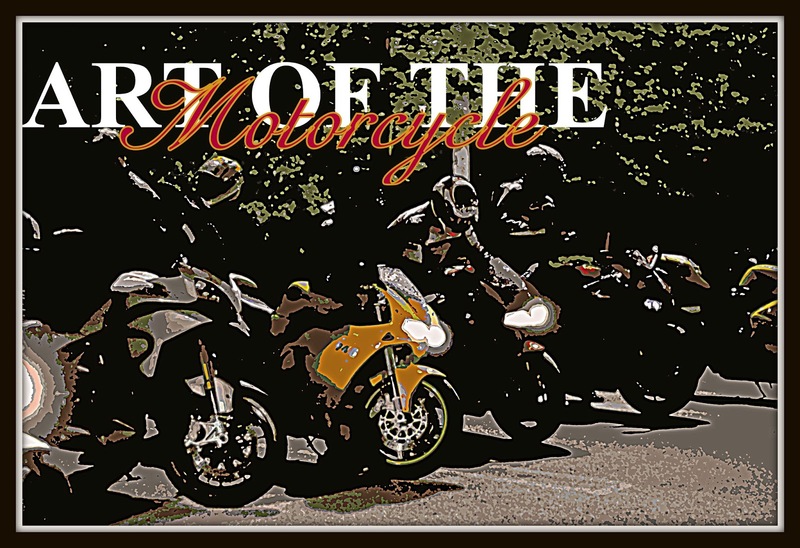 Art of the Motorcycle will also be on display Friday, 12PM to 10PM and will remain in the gallery until June 22nd during normal business hours of Wed-Sat 12PM to 5PM. We had so much fun at our very first NEODESMO Club Mangia last night at Buca di Beppo in Strongsville, Ohio! 14 Members made it through the traffic and shared an Italian meal for two hours, then roared off into the rain. We'd met most of you at the Launch Party but we did get to see some new faces! Again, what a great group of Ducatisti that call Northeast Ohio home! You can see all of the pictures in our Facebook album. 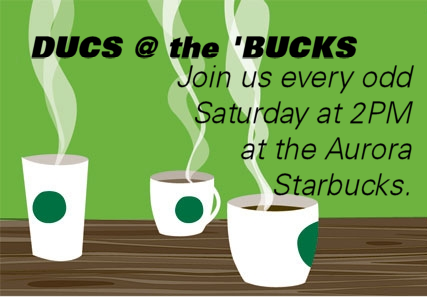 In the meantime, don't forget that this SATURDAY is our 3rd Ducs @ the 'Bucks at 2PM at the Starbucks in Aurora. Several members are planning on meeting at Northern Ohio Ducati and Triumph in Akron that morning, then riding to Starbucks. From there, you can ride down 82 for a twisty cruise through Cuyahoga Valley National Park. 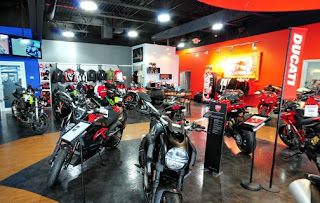 Additionally, we're told that BMW Motorcycles of Cleveland is having an open house that day and they are just up the road on 43 from Starbucks. Also, it was announced last night that we are eagerly awaiting a response from Ducati as they've confirmed they received our DOC application! NEODESMO First Club Mangia This Week! This Wednesday is the second Wednesday of the month so that means it's time for Club Mangia!! We'll see you at the Buca di Beppo in Strongsville at 7PM. Buca di Beppo is a family style restaurant with in-your-face Italian decor to get us in the spirit! If you are coming alone, you may leave pretty stuffed or have more to take home with you! Or, you might find someone else that will share a dish. 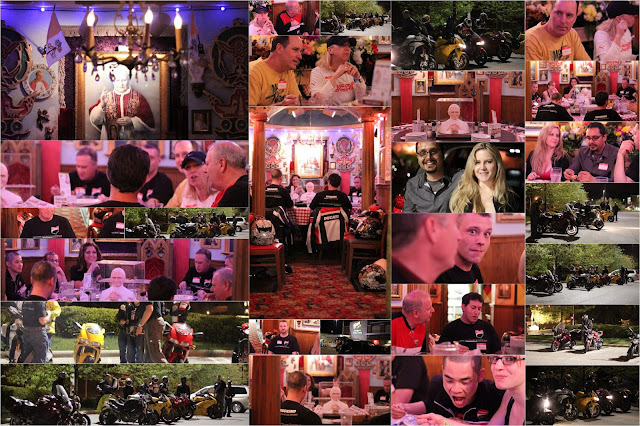 There is a post on our Google Group for those on the north side to meet up for the ride to the restaurant. Please post there or Facebook if you want to meet up with others near your area. We'll see you there! Learn more about Club Mangia here. Please note that the Suspension Clinic scheduled for tomorrow, May 4th, has been postponed due to schedule conflicts at the dealer. We will notify you when a new date has been scheduled. We're sorry for the inconvenience but look forward to seeing you next week on the 8th for our very first Club Mangia at Buca di Beppo! Tonight, Friday, April 26th (4:30-6:30): We'll be at Ohio Motorcycle for their 2013 Hypermotard Premiere. Or, go to Northern Ohio Ducati and Triumph to check it out there! Tomorrow, Saturday, April 27th (10-4): Join us at Northern Ohio Ducati and Triumph for their 2013 Hypermotard Premiere. Then we'll be at Ducs at the 'Bucks at the Aurora Starbucks at 2PM. We had such a fun time meeting everyone that could make the Launch Party! About half of our Members attended and what a GREAT group we have! We have had a few new Members sign up since the party, too! Since we hit 50 Members, we've submitted our application to be a DOC with Ducati. We hope to hear from them soon! We have MotoGP @ NODT on Sunday, the race starts at 2:30. Then next Friday and Saturday, both dealers are having an Open House for the new 2013 Hypermotard - go check it out! 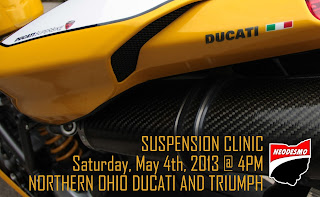 Saturday, May 4th is the Suspension Clinic at NODT. Our first Club Mangia is Wednesday, May 8th, at Buca di Beppo's in Strongsville, then the following week we'll be on the Dragon! There is no shortage of events in the coming weeks! We hope to see you there! Thank you also to everyone that supported the Club by grabbing the Founding Member T-Shirt. We are all out of sizes small and medium but do have some large, XL, and 2XL left. We'll bring them to some of the events coming up and if there are any left after that we'll put them on the website. We do not have a board or officers but will appoint passionate Volunteers. We have decided on this architecture to 1) keep our administrative time and overhead costs low, and 2) allow for quick decisions and changes as needed. We are an Official DOC and our partner Ducati dealership is Northern Ohio Ducati and Triumph in Akron. NEODESMO is a member driven rather than member run club. Our experience and the advice of other clubs prove to us that this is the most successful format. We consider it a living club that is easily adaptable as it grows. The purpose of NEODESMO is to organize regular, fun community gatherings at different destinations and provide a wide variety of get-togethers on its Events Calendar to its members. We encourage all input. If you would like to see an event/activity added to our event calendar, submit it for approval/planning via neodesmoclub@gmail.com. We have decided against charging dues. If you wish to support the Club, you may do so by purchasing NEODESMO products. Membership is free and open to anyone that is passionate about the Ducati brand. Present ownership of a Ducati is not required and members are not required to ride their motorcycle to any event. A person is considered a member when they have submitted a completed membership form and signed our release of liability waiver. No minors (under 18) are eligible for membership. All members must have a valid motorcycle endorsement. Passengers: All passengers must sign our Release of Liability waiver. Absolutely no minors may ride passenger on any motorcycle to any event at any time unless they are 2up with their parent. Members engaging in unacceptable behavior during club events/activities may have disciplinary action taken against them by NEODESMO,LLC or its appointed volunteers, including, but not limited to, ejection/exclusion from club events/activities, membership suspension, or membership revocation. Bases for discipline may include, but are not limited to: grossly improper social conduct, including offensive language or gestures; lewd conduct; harassing or threatening of other club members by any means; verbal or physical conflict with another person; intentional efforts to damage the Club’s reputation or subvert its purposes or interfere with its regular functioning; any behavior that violates law; or unsafe operation of a motorcycle on Club rides or other events, including operating a motorcycle under the impairment of alcohol or drugs. Alcohol is frowned upon at a club event if you are riding your motorcycle. If you are deemed impaired by any member, you will not leave with the group. One drink per hour is considered a maximum amount and remember that two wheels and alcohol don’t mix. Do not touch or sit on another member’s motorcycle without express permission from its owner to do so. Any Ducati dealer or third party has the right to ask any Club Member to leave at any time for any reason. We are grateful for all of our partners and demand respect for their property and staff from our members. 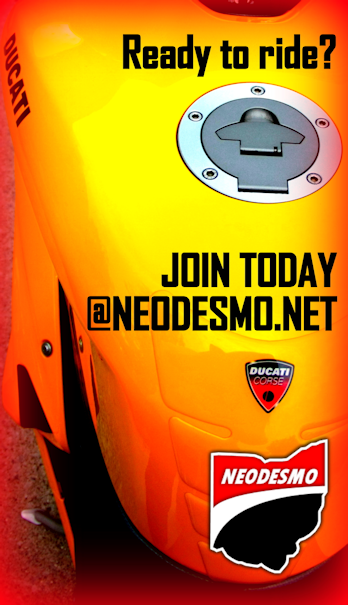 · NEODESMO, LLC will NOT organize group rides, we will organize destinations (such as “Ducs at the ‘Bucks” and monthly dinners). If, however, a group of members organize a ride on their own, even if an Owner or appointed Volunteer is present, that is not a Club function or Club organized ride. Common sense must be exercised in riding in such groups. For example, the leader is responsible to stop and check that all riders are comfortable with the pace. If a novice rider goes out with an expert or intermediate group of members, and doesn’t feel comfortable at that group’s pace, they should notify the leader at this first stop that they are aborting the ride. Members can utilize our Google Group to plan small group rides. Groups should be limited to no more than six bikes, more than that should start over with a new group (leader and caboose). · IF YOU HAVE NEVER RIDDEN IN A GROUP - PLEASE contact us to schedule a time to ride together so we can go over all of the guidelines and practice. Please take a motorcycle safety course if you haven’t already. · Absolutely no horseplay will be tolerated. Both wheels on the ground at all times. 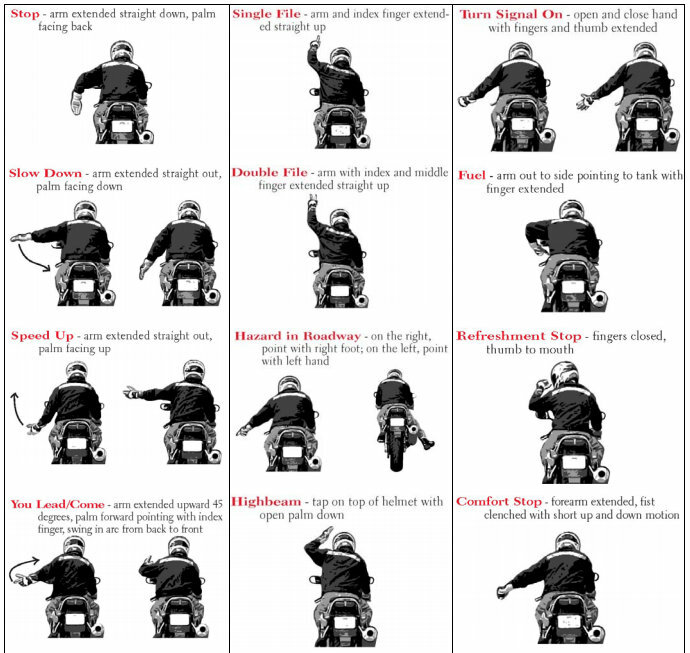 Any member riding in a group is expected to follow group riding guidelines and use appropriate hand signals. Ride with a group that suits your skill level and do not pass the leader of your group. No passing in any turns, only on straights. All riders are expected to have appropriate gear, HELMETS ARE REQUIRED. All riders are expected to ride at their own pace and comfort level and use their own judgment when making traffic flow decisions (do not assume an intersection is clear of traffic because the person in front of you proceeded). · Please visit the Group Riding section of our website and review the video and document on group riding prior to riding with others. It is imperative that you know how to ride in a group properly for everyone's safety. You should know correct formation, hand signals, how to make traffic flow decisions, etc. Please take ten minutes to watch this video, hopefully for only a refresher, before choosing to ride with members of NEODESMO. We, and your fellow Club Members, appreciate your commitment to safe riding! and the group’s riding style. kit, so the group is prepared for any problem that they might encounter. procedure in place to regroup. Don’t break the law or ride beyond your skills to catch up. Visit www.msf-usa.org for other valuable information like this! 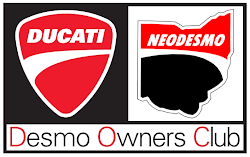 NEODESMO Northeast Ohio Ducati Owners Club Members can join us Sunday, April 21st, between 2-2:30PM to watch the MotoGP Race from Austin live on Speed! Northern Ohio Ducati and Triumph will open their doors for us at 2PM. See you there! Go Ducati! We are a week away from our LAUNCH PARTY at Northern Ohio Ducati and Triumph at 6PM. Just a reminder that you can sign up online before the party via our Membership Form. If you have issues with it, trying a different browser or reloading the page may work, it also can take some time to load. Alternately you can email us at neodesmoclub@gmail.com and we'll let you know what information we need. If you are a member and want to join our Google Group, just send a request. The weather keeps changing for this Saturday's Ducs @ The 'Bucks but it at least is still saying sunny weather is expected. We will be there, rain or shine. Remember to wear a Ducati shirt if you have one! Mangia is Italian for "eat" and it's probably our second favorite thing to do after riding Ducati's, right?! Club Mangia is our dinner meet-up and it takes place at a different Italian restaurant each month. 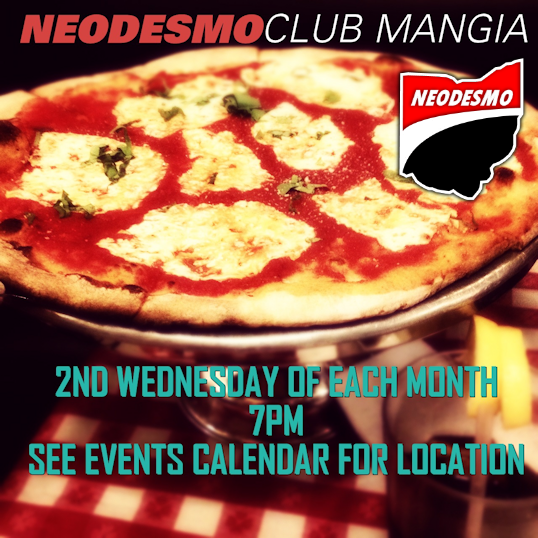 NEODESMO's Club Mangia is scheduled for the second Wednesday of each month at 7PM. The 2013 dinners are listed on our Events Calendar. We will send out an email close to the date asking for your RSVP, just so we can let the restaurant know how many to expect. Please try to respond quickly. You can come on two wheels or four and family and friends are always welcome. Meals average from $15-35/per person, a link to the restaurant's website is included in the calendar so you can check out their menu ahead of time. As always, please remember that alcohol and two wheels DON'T mix - if you ride your motorcycle and choose to drink, please keep it to a max of one drink an hour. Wow - 35 members and only 15 chances left to become a Founding Member of NEODESMO! We can't wait to hit 50 members and submit our application to Ducati, so our Club Members can receive all of the benefits of being an official DOC. With the support of both area dealers and a growing network of riders, especially on Facebook, we are destined to be an amazing community of Italian bike enthusiasts! We are determined to make this an enjoyable experience for all of our Members, starting with the decision to not charge dues and make membership free. Our passion for Ducati runs deep and we can't wait to share that with all of you. We have almost finalized all of our events and have a few more great ideas from our Members in the works! You will get all of the details at our Launch Party on Wednesday, April 17th at Northern Ohio Ducati and Triumph at 6PM. See you there! Suspension Clinic - May 4th! Ah, the mystery of suspension adjustment. Did you complete yours a long time ago or did you just leave it at the factory setting? 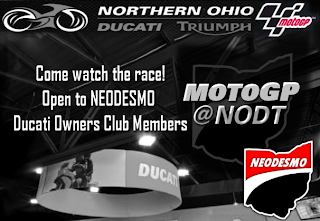 Whether the process is crystal clear to you or if you don't even know what I'm talking about, join us at Northern Ohio Ducati and Triumph on Saturday, May 4th at 4PM as their Pros break it down for members of NEODESMO. 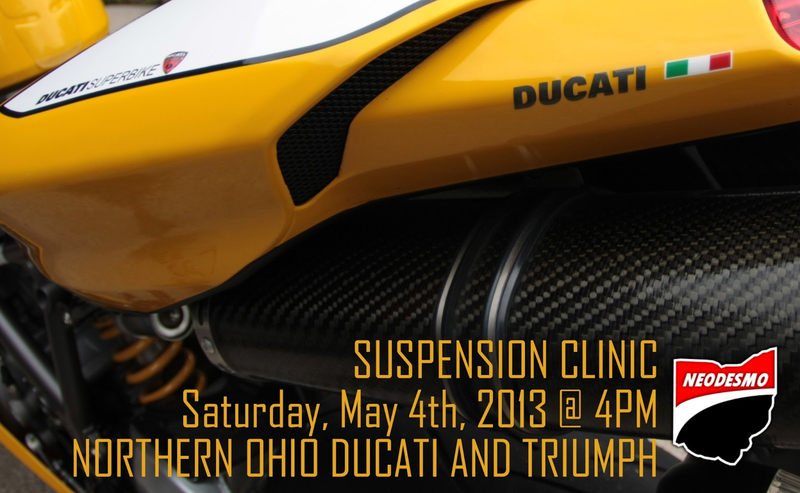 This is an amazing opportunity to get expert advice on adjusting the suspension on your Ducati, don't miss it! Introducing. . . DUCS at the 'BUCKS! In celebration of reaching 25 members (half way there! ), we've announced one of our planned events! DUCS at the 'BUCKS occurs every odd-numbered Saturday at 2PM at the Starbucks in Aurora. There is outside seating for when it is nice and ample room inside for the chilly days. We've talked to the owner and you may park your bikes in the small area to the right of the building, opposite of the fire lane next to the park. If you have to take your cage, please park in the normal spaces. This location is next to a movie theater, Subway, Doogan's, Heinen's, etc. and is just minutes from the outlets at Aurora Farms. After the initial gathering, this may be a starting point for a ride nearby. Those in attendance can decide! See our Events Calendar for all of the dates! Please wear Ducati attire if you have it.